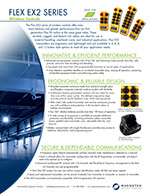 Ideal for industrial equipment and overhead cranes! These units have auto-scan, so there is no need to change DIP switches on receiver with advanced microprocessor controls using a 32 bit CRC and Hamming Code to provide ultra-fast, safe, precise and error-free encoding and decoding. Self Adjusting RF, no RF tuning needed. Pitch and catch, random access, and tandem functions are standard. 62 available channels, adjustable without changing the printed circuit board. Removable, durable power key to stop unwanted use. Enclosures are chemical resistant and sealed to IP66 specifications with accidental transmitter drop detection capability, ceasing all operation. 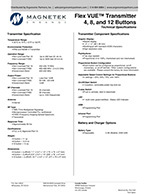 Full compliance with FCC Part-15 rule. Full system compatibility. All systems work with each other, minimizing the need for spare parts. 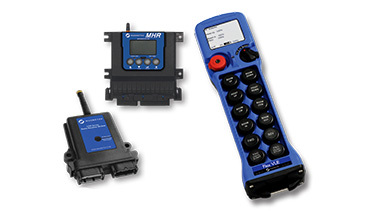 The Flex series remote controls are small to mid-size hand-held rugged systems used for material handling, mobile hydraulic, and industrial applications. This radio remote control unit can be used for indoor or outdoor applications. 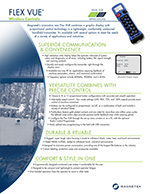 The transmitter sizes are durable with 4, 6, 8, or 12 buttons that are large enough for gloved operators. The buttons can be field setup to be either momentary or maintained functions. The additional features include a latching E-stop switch and removable key switch, over 150 field settable functions, pre-wired receiver with 6 foot of cable. 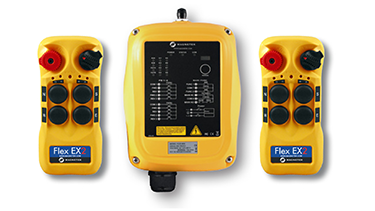 The Flex EX2 A/B radio systems allow for one crane operator to select between two trolley/hoists located on a single bridge (A, B or Both) controlling both at same time or each trolley/hoist separately. 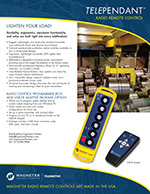 The systems come in both 3 motion and 5 motion allowing for control of an auxiliary hoist. Call (314) 884-8884 or Email for pricing. The Flex EX2-RS package enables one crane operator to control up to 2 bridges and 4 trolley/hoists at the same time or independently. The tandem system allows two crane operators to control two bridges/cranes or trolley/hoists at the same time or independently. Quickly and easily configure the transmitter right through the LCD display menu. 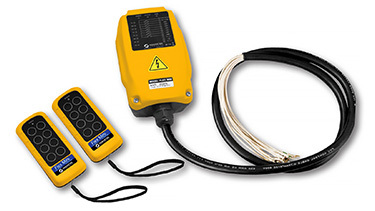 Available two-way RF for applications requiring feedback of machine parameters, alarms, and command confirmation. Frequency options include 400MHz and 2.4GHz. Choose 4, 8 or 12 stepless or two-step technology button configurations with accurate and smooth operation. Adjustable speed control – four mode settings (25%, 50%, 75% and 100% output) provide exact control of machine movement. Buttons can be configured as proportional, on/off, or a combination of both and include a variety of standard labels. 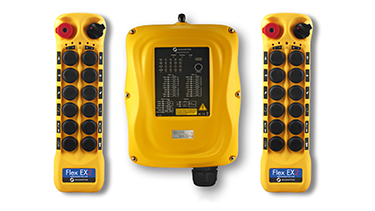 Configure the Flex VUE on a PC with the optional Radio Control Programmer and Easily upload new programming in the field with USB connection. Rugged, super tough nylon housing is made to withstand shock, water, heat, and Rated NEMA 4 (IP66), sealed to withstand harsh, industrial environments. Designed to minimize power consumption, providing one of the longest life batteries in the industry today. Ergonomically designed contoured case makes it comfortable for the user with custom labeling, protective cases and accessories available. Designed to be compact and lightweight and one-handed operation frees the operator to assist in other tasks while preventing operator fatigue. 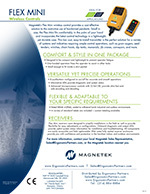 Let Ergonomic Partners help build a Flex VUE system to your specifications-with Magnetek's Flex M receiver, it's completely customizable. Call (314) 884-8884 or email us for more information. 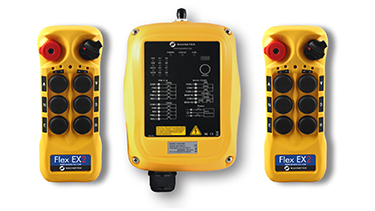 The Remtron, Patriot brand series of controllers are the most affordable, high quality wireless crane controls available. They are 100% American made (Made in the U.S.A.). All Patriot models use Remtron's proven Command Pro technology, with an exclusive extruded aluminum receiver enclosure. Systems feature: Up to 15 functions, 3 two-step rocker switches, 6 push buttons, On/Alarm and Off/Stop buttons, 300- ft. obstructed view, 1000-ft. line of sight (unobstructed), 2 standard AA batteries can operate up to 130 hours, transmitter is IP67 design (waterproof/dust-proof) and receiver is IP52 (indoor use). Ergonomic, lightweight, rugged, chemically resistant transmitter case withstands shock and abusive environments is a traditional pendant-style pushbutton station switches, rated for a million plus operations, available in two- and three-speed designs. All Telemotive products are designed to minimize power consumption, providing one of the longest life batteries in the industry today. Electronically synthesized frequency allows for 31 operating channels-no crystals to break. Time Multiple Shared feature-four systems can share the same channel without interference. 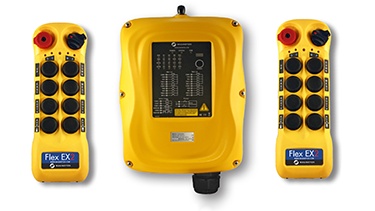 4-in-1 transmitter design supports multiple cranes via password protected access code. Flexibility in programming means you can customize output configurations, frequency channels, and security code via a Radio Control Programmer with IR Adapter Communication (P/N: RCP-IR). Systems are included with our inteleSmart receiver features: Custom output mapping via the USB/IR Adapter, Available in 12 to 24 outputs, Synthesized RF - up to 31 operating channels, Designed for VFD, PLC and contactor controls, Compact design, NEMA 4X Enclosure. telePilot's ergonomically designed lightweight 4-in-1 transmitter design supports multiple cranes via a password protected access code. Extremely durable extruded aluminum transmitter housing Available in three-motion, two-speed and three-auxiliary functions, or three-motion, two-speed, one auxiliary function, and A, A+, B or B.
Wireless crane pendant unit designed with sub-voltage technology providing a much longer operating life. Switches designed with a rated life of over one million operations. TPDTSYS12-22FMINI Mini telePendant System-One TR12 Mini inteleSmart Receiver, "Two" telePendant 2-speed, 3 motion transmitters with A/B Select, 2 or 3 Aux. and two AA batteries. 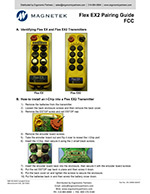 TPDTSYS12-21FMINI Mini telePendant System-One TR12 Mini inteleSmart Receiver, "One" telePendant 2-speed, 3 motion transmitter with A/B Select, 2 or 3 Aux. and two AA batteries. 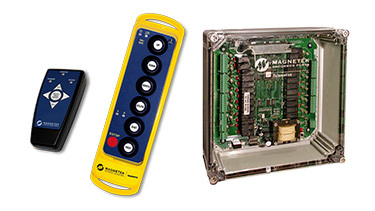 Ergonomic Partners sells, services and distributes crane radio remote controls; serving clients from coast to coast, Canada, Mexico and especially focused in the states of Missouri, Illinois, Indiana, Kansas, Arkansas, Mississippi, Nebraska, Tennessee, Kentucky, Iowa, and Oklahoma.